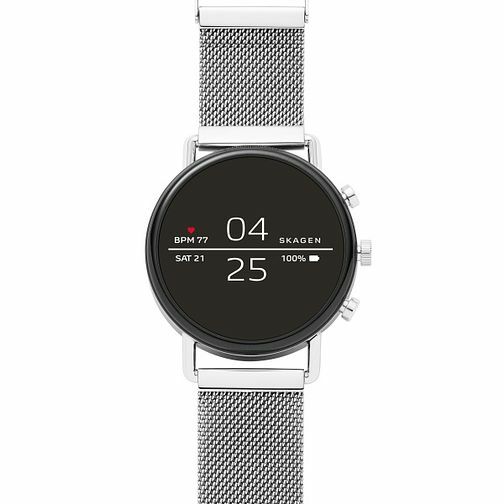 Skagen presents this sleek IP Connected Falster 2 in a polished stainless steel bracelet watch. The SKAGEN Falster 2 smartwatch boasts a range of exciting updates, including GPS, rapid charging and heart-rate monitoring. It is outfitted with three pushers, which provide additional customisable functionality. The Falster 2 smartwatch is the perfect balance of form and function—modern, minimalist design plus technology that simplifies rather than complicates. Smartwatches powered with Wear OS by Google are compatible with iPhone® and Android™ phones.